SsangYong will also launch its all new model line-up with autonomous emergency braking and forward collision warning standard on every model, including the Musso Ute. And in more good news for customers, every model in the SsangYong range will come with a bumper to bumper seven-year, unlimited kilometre warranty complete with seven years' roadside assistance and service pricing. "We are very excited to reveal this welcome news as we prepare to launch the all-new SsangYong range of vehicles into Australia," said Managing Director Tim Smith. "We know that safety is a key feature for Australian customers and we do not want to make AEB or FCW an option or extra cost for a customer wanting to choose any model in our all-new range. "We want customers to know their most precious cargo is afforded the maximum protection, no matter which model they choose. "We are determined to offer Australia a range of vehicles that are fun to drive, great value to own and complete with a suite of the latest safety technology." Pricing begins with the Tivoli EX at $23,490 for the petrol version with a manual transmission. "That vehicle will come standard with a host of features including Apple CarPlay/Android Auto, seven airbags, reverse camera, AEB and FCW as standard," said Smith. The Tivoli range consists of six models with a range of powertrain choices. The EX will be available only in petrol, with the choice of a six-speed manual or automatic transmission driving the front wheels. The ELX will be available exclusively in automatic, with the choice of the 1.6-litre petrol or the 1.6-litre diesel engine, offering 300Nm of torque. The range-topping Ultimate will be all-wheel drive, matched to the diesel engine. It will also be available in a two-tone pack, with five different colour combinations for customers to choose from. The Tivoli XLV (X-citing Lifestyle Vehicle) takes all the outstanding features of its sibling and amplifies them – to the tune of an extra 245mm. It gives the XLV a capacious rear cargo area, measuring 720 litres. The XLV will be available in three trims only: ELX 2WD, Ultimate AWD and Ultimate 2WD two-tone. All will come with Tivoli's feature-laden specifications, including AEB, FCW, Apple CarPlay/Android Auto, seven airbags, reversing camera and front/rear parking sensors. Pricing starts at $31,990. The Ultimate versions will feature leather interior with heated and vented seats, 18-inch alloy wheels, sunroof and the option of two-tone paint. The Rexton SUV will offer a new alternative to customers looking for a seven-seat SUV, with its mix of style and features. It will also offer outstanding value for money. The entry level EX 2WD will come with a 165kW turbocharged petrol engine, matched to a six-speed automatic transmission. It will come loaded with a host of features, including Apple CarPlay/Android Auto, AEB, FCW, High Beam Assist, Lane Departure Warning and dual zone air conditioning. The ELX will be launched exclusively with a powerful 2.2-litre diesel powerplant, delivering 133kW and 420 Nm, driving all four wheels via a Mercedes-Benz seven-speed automatic transmission. It adds new TPU seats, nine airbags, blind spot detection, rear cross traffic alert and lane change assist. The range-topping Ultimate comes complete with heated and ventilated leather seats, 20-inch rims, 360-degree camera, sunroof and a powered tailgate. Pricing for the Rexton range starts from just $39,990 drive-away. 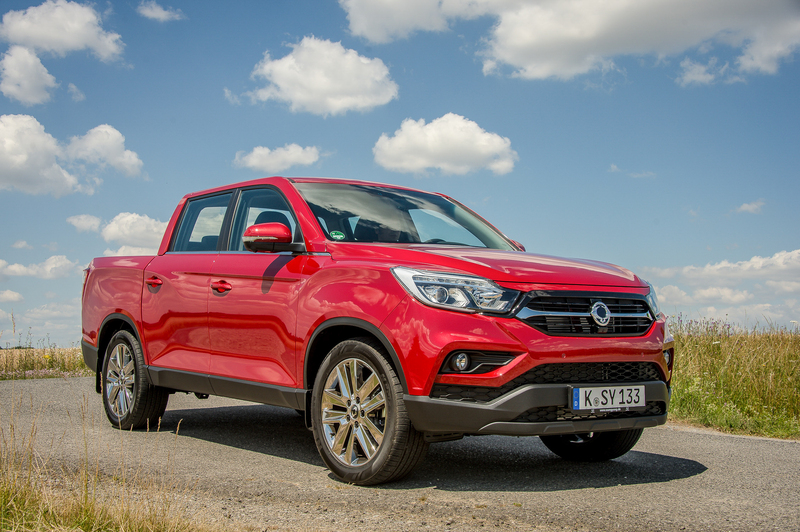 The all-new Musso dual cab ute is set to spearhead SsangYong's return to the light commercial vehicle market with its styling, performance and value proposition. "The Musso will come with a 3-tonne tow rating from the factory. We know how important towing is to Australian consumers and we are already working with suppliers to homologate for a 3.5-tonne rating for the Musso and the Rexton," said Smith. The Musso range also features AEB and FCW as standard across the range and comes in three trims: EX, ELX and Ultimate. The EX – like every model in the Musso range – is powered by the same 2.2-litre turbo diesel found in the Rexton, delivering 133kW and 400Nm. It comes standard with AEB/FCW, fabric seats, Bluetooth connectivity, a limited slip differential and full-size spare wheel. The EX is available in both 6-speed manual and 6-speed automatic transmission and starts at just $30,490 drive-away. The ELX adds 18-inch alloy wheels, Apple CarPlay/Android Auto, blind spot detection, rear cross traffic alert and lane change assist. The Ultimate rounds out the Musso range, adding heated and vented leather seats sunroof 20-inch alloys and 360-degree camera. "With a high degree of safety features, great warranty and outstanding pricing we look forward to offering Australian customers a new choice in motoring when we go on sale in November," said Mr. Smith. SsangYong cars are manufactured in South Korea by SsangYong Motor, which is 73 per cent owned by the Indian engineering conglomerate Mahindra & Mahindra. Established in 1954, SsangYong is Korea's oldest vehicle manufacturer and only 4x4 and SUV specialist producer. 2018 SsangYong Musso has 3.0-tonne towing capacity.